Salvias are one of the most reliable plants for South Texas gardens. Salvia flowers support butterflies and hummingbirds, no matter the color of the bloom. Most salvias provide color throughout the summer and into early fall with the exception of the Mexican bush sage, Salvia leucantha, which flowers in the fall. Salvias are in the mint family and all have square stems and some are fragrant. All salvias require full sun and are drought tolerant. They require good drainage and will quickly die out if exposed to flooding conditions or over-watering. Some shading from hot summer suns will prolong the bloom period of most varieties. Some salvias are annuals, like our South Texas native, Salvia coccinea, but reseed in the garden. Controlling salvias such as Salvia coccinea from popping up throughout the garden can be done by cutting off the spent flower spires before seeds set and spread. Salvia coccinea can be a long-lived annual in South Texas, if you trim it back after blooming. This keeps it from getting leggy and adds to the life of the plant. Most of the salvias will remain compact and benefit from trimming after they flower. 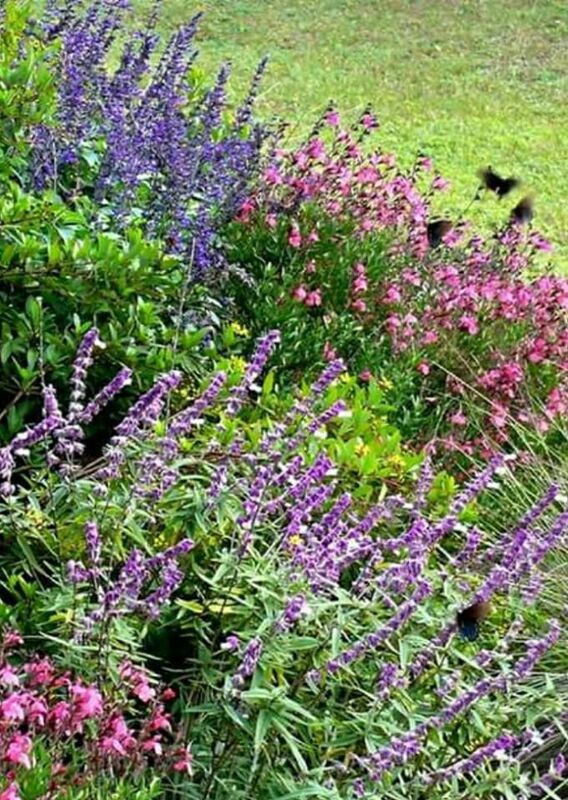 Colors of salvia include white, pale pink, peach, vivid blue, purple and red, making them very versatile in the garden. The Mexican bush salvia is a great one for the center of a bed that can be seen from both sides, or use it as a backdrop against a wall. This salvia will grow upright for about 2 1/2 to 3 feet and then gracefully fall forward. Give it space (about 3 inches from center) to do this so that it does not cover plants in front of it. Do not over fertilize salvias. Adding compost to your garden bed is a great way to start them off and you can add more compost, once more, during the flowering season. Gray-leaved Artemisia , especially the ‘Powis Castle,’ works well inter-planted with the salvias and helps to display some of the dark blue varieties. Several salvias have made the “Superstar List” at Texas A&M, meaning they have been tested throughout Texas for their suitability in gardens throughout the state. The newest salvia to make the list is Mystic Spires Blue (improved-2018). You can find more information on this Texas tough plant and other salvias at Texassupperstars.com. And, if you are looking for a large selection of salvias in many colors, be sure to visit Waugh’s Nursery on Jackson Road, just north of Nolana in Pharr. Barbara Storz is a local horticulturist. You can listen to her radio show at 7 a.m. Saturdays on KURV Radio, or email her at bstorz@rcommunications.com.